The Diversity Summit is a special tradition at Morrison & Foerster. Since the early 1990s, the firm has hosted biennial professional development workshops designed for our U.S.-based attorneys of color. These workshops gather diverse associates from across the firm’s domestic offices for a two-day program of professional development, diversity-related trainings, speakers/panels, and opportunities to build firm relationships and network. They also provide an occasion to update associates on firmwide diversity initiatives and solicit feedback. In 2014, the workshops were further expanded to include LGBTQ+ lawyers and came to be known as the MoFo Diversity Summit. The 2018 Diversity Summit welcomed over 130 MoFo lawyers and staff to celebrate the personal stories and narratives that make us unique. The theme, “Putting Our Stories to Work,” represented how we use storytelling to draw connections amongst our colleagues and clients. When we bring our whole selves to work, we enrich our collective experience and become stronger. At MoFo, our diversity is the reason for our success. The two-day event explored personal journeys to partnership, successful mentor/sponsor partnerships, and professional development, such as business development sessions on building your network and pitching to clients, and effective communication workshops. Something unique to the 2018 Summit was the special track created for the Wetmore Fellows and diverse Bay Area associates. Fellows and summer associates were asked to develop a pitch for the MoFo Foundation to donate money to a nonprofit of their choosing. The winning Fellow, Jamis Barcott, who summered in our LA and SF offices, won $5,000 for the Indian Law Resource Center (ILRC), a law and advocacy organization established and directed by American Indians. Runners-up Michelle Sosa-Acosta, a 2L from our SF office, and Amanda Sadra, a 1L Fellow from our LA office each won $2,500 for College Track, a nonprofit helping low-income high school students attend college, and Los Angeles’s Downtown Women’s Center, an organization that fights homelessness among women, respectively. Also new to this year’s event was the client and alumni reception hosted after day one of the Summit. Associates enjoyed networking with local clients and alumni, and MoFo alumnus and Chair Emeritus Keith Wetmore had a chance to meet the 2018 class of Wetmore Fellows, a program initiated under his leadership seven years ago. To read more on the 2018 MoFo Diversity Summit, visit our MoFo+ blog. 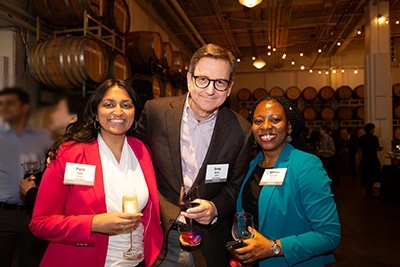 The Summit provides an opportunity for cross-practice networking for MoFo’s Purvi Patel, Craig Martin, and Cynthia Akatugba. 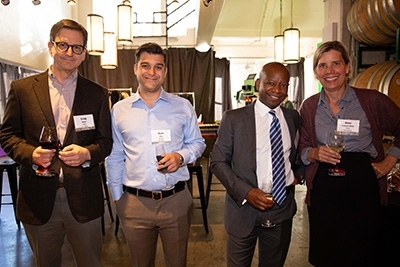 MoFo’s Craig Martin, Dean Atyia, Trevor James, and Anna Erickson White enjoy the Dogpatch WineWorks reception. Keynote speakers have included Kenji Yoshino and Chief Justice Earl Warren Professor of Constitutional Law at New York University Law School. We have also hosted professional development workshops with Victoria Dicce from GK Training and Werten Bellamy, President of Stakeholders, Inc.